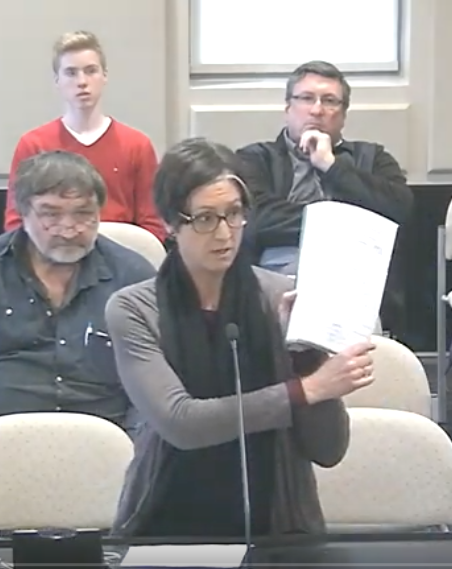 In a 6-2 vote, Sackville Town Council approved a five-year recreation master plan at its meeting last Monday after rejecting an appeal to include a reference to a pedestrian walkway over the TransCanada highway. DeHaas said that including this wording in the latest recreation master plan would reflect the wishes of 519 people who had previously signed a petition supporting construction of a pedway over the highway as well as members of the Sackville Pedway Working Group and supporters of the TransCanada Trail. But Evans went on to say it would be dishonest to refer to it as a priority in the recreation master plan because the town doesn’t have the money in its capital budget to build it. He added that the under-highway corridor referred to in the old plan was primarily intended to allow wildlife to cross the highway. Evans said that not including mention of the pedway in the recreation plan won’t prevent the working group from continuing to seek funding or whatever else would be needed to make a pedway happen. “But I don’t think it’s fair for us to sign off on a document that says it’s a priority when I honestly don’t think it is,” Evans said. Later, when the recreation master plan came up for approval, Councillors Shawn Mesheau and Bruce Phinney asked council to delay the vote until July 8th. 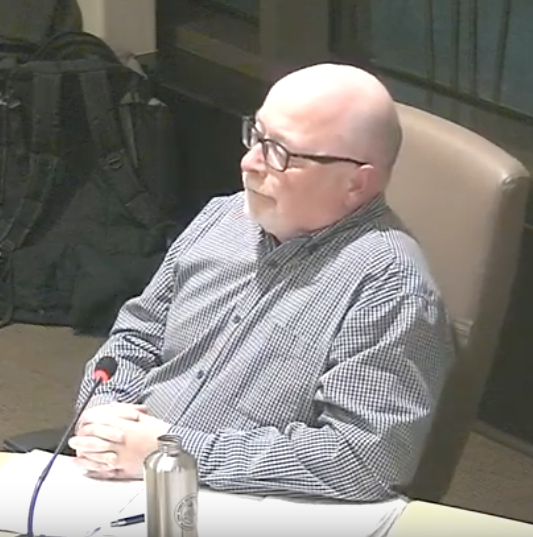 Councillor Mesheau explained that such a postponement would allow time for a public presentation and for citizens to ask questions that might lead to changes. However, Councillors Evans, Butcher and Black along with Deputy Mayor Aiken said there had already been extensive public consultations and so, there was no need for a delay. In the end, six councillors voted to approve the plan with Councillors Mesheau and Phinney voting against it. To read previous coverage of the pedway proposal, click here. To read previous coverage of the recreation master plan, click here. This entry was posted in Town of Sackville and tagged Christina DeHaas, recreation master plan, TransCanada pedway. Bookmark the permalink. Overpass was a great idea both for recreational activity and safety – highschools travelling back and forth …You must know that young local Alex Thomas had made a terrific Petition for it a while ago and Wendy Alder’s company AIL would be happy to be involved too… why do we ignore bright young men like Alex Thomas? Why do we put so much favour and influence with visiting mta.ca students? Pedway would be a nice want to have but there are many more pressing issues that are sadly ignored in the town. I walk daily and have no issue with crossing the walkway up by the exit 504 area and then using the path that goes all the way down to Cattail Market. Then over the next overpass to our businesses end of town at 506. We had a petition with quadruple the number of signatures to support getting a drive thru but that didn’t make a bit of difference so I doubt 500 will sway things. But who knows? We seem to let less amount of people continue to push for glorified projects instead of realistic solutions to things. And yes AIL could have provided a very affordable option but town of Sackville usually purchases from outside businesses for products that they could offer. They like big vanity name-plate projects. Town Hall is the ultimate example. The old one wasn’t big enough? Sure it was. The problem would have been better dealt with by shrinking the size of the government. Overall, I’d say that the big problem is that many councillors are not out to govern this town for the benefit of its citizens. They’re out to use it as a platform to grandstand their way to bigger things. That’s why vanity projects are so “hot”. They’re the kinds of things that get “noticed” in the press, etc. To be blamed for this, of course, is the fact that collectively, these people get voted in. – Doing a good job of town administration is a thankless task that usually interferes with one’s life and earning potential if done honestly. Bruce Phinney is an example of a councillor that always gives it his honest best. But such people are rare. This leads to a situation where many will be, at best, low energy, or at worst, have ulterior motives. It’s a fundamental design flaw. – 9 councillors is a LOT for such a small town. It means that, in practice, voting is an exercise in choosing the least-bad from the lot. I think that there were a total of 15 or so running, the last time. This means that one picks the 2-3 good candidates, and then it’s down to picking the “least harmful”. My proposed solution would be to “halve” the number of councillors from 9 to 5, and double the pay. This would make the financial incentive more in line with the time spent. Doing a good job wouldn’t so much come at a direct cost to oneself. This would increase the pool of quality candidates. Moreoever, by having fewer councillors, picking the 2-3 good candidates from 15 would lead to a much better result than it currently does – as well as diminishing the “transaction friction” that comes from having too many people involved. The trouble is, shrinking the size of Council would require Council to vote on it, or the province to intervene. Sadly, I don’t see either happening. So I see a lot more useless vanity projects in our future unless a concerted group is made to elect councillors to a “suicide squad” willing to reduce themselves out of office. Comment from Bruce Wark: Sackville Town Council consists of a mayor, deputy mayor and seven councillors. Good points Louis. — Amherst with a population of 9,500 seems to get by really well with the Mayor and six Councillors, one of whom acts as the Deputy Mayor. We attended their monthly Town Council meeting two months ago and we both were very impressed with how well everything rolled along so smoothly. Their decision making process seemed very efficient and without much idle chatter to drag out the meeting. I certainly could see our small Town of only 5,300 shrinking back to six or even to five Councillors plus Mayor. And yes, the ridiculously low token salary given should be at least doubled and then it would still be way below the Amherst level. One has to realize that the amount the Mayor and Councillors show on their Income Tax form is highly taxed as every penny they make is on top of all their other income. Currently the total paid to our Sackville Mayor and eight Council members is well under one percent of our overall budget for running our Town. That needs to change. Louis, Under your proposal the 2016 municipal elections would have resulted in a council of Mitton, Black, Butcher, O’Neil and Evans. I presume this is not really a result you would prefer since Phinney would be out. If your going to bother “gerrymandering” you should first make sure it would work to your favour. You’re correct that it’s a result that I’d be sad to see happening, but I don’t think that failing to redesign the system towards something better should be avoided because of what might have been the result of a specific election. That would pretty much be classic gerrymandering :-). And I do say “might have been” – because with fewer to be selected, the voting patterns could have been completely different. A lot of “ugh, I guess I’ll put this one in as my 6th choice” votes would drop off. It also fails to account for the possibility that a better system would attract better candidates overall, which I think would be the case. The only thing I know for sure is that the current system attracts very few quality candidates. I also see TLA’s point (in reply to yours) that this type of thing would be re-arranging deck chairs on the Titanic, as the bigger problem is elsewhere: technocrat/bureaucrat de facto control (partly due to lack of Councillor time), provincial/federal mandates which effectively pre-determine decisions, etc., resulting in a local government problem that goes well beyond the problem of how Council is selected. The various pressures that come from “grant money” and other “initiatives” out of other levels of government, and similar forms of suasion (such as the desire to be “trendy”), can easily subvert local initiative entirely, regardless of whom is on Council. Similar problems happen elsewhere and at other levels of government also, of course. You forgot to mention the part about the earth being flat. Thanks for the correction Bruce. I sloppily referred to “councillors” when meaning the whole of Council. I should have said “9 on Council” and not “9 councillors”, being as Council also includes the mayor. I think that the whole of Council down to 5 would be about right. Please have a look at the minutes of the September 14, 2015 council meeting posted on the town website, page 9 under new business. A plebiscite was suggested to determine if voters wished to see the size of council reduced and the motion was voted down by a majority of council to allow a plebiscite. I was unaware of that. A shame that it didn’t pass.